Locally Grown fresh cut flowers for any occasion. Start by calling Susan 18282974098 with your order or questions. You may also fill in one of the forms below. These allow us to collect your contact information and answer you with accurate pricing. For bucket orders use This Form All bucket orders are DIY, no consult is included in the price. However, feel free to call any questions. Click here for our DIY info page. Wedding designs: usually involve a free consult appointment. We also work with many brides from out of town. Start by filling in, the above Inquiry form, or email a request. These forms allow us to collect all your information and attach pricing for you. When finished, you will also receive a simple contract to sign electronically. Communications: please add the Bride's name and wedding date to all communications. Let us design something beautiful for you. Thank-you for considering locally grown flowers and supporting local farmers! To insure a date or any order of flowers, sooner is better. We're finding a few dates each summer month to be very popular. So.... place you order with 1/2 deposit well ahead of your wedding. Sorry ladies, just telling me you want to use our flowers doesn't get you on the calendar. Looking for loose, or 'bulk flowers'? Order by the bucketful. Mixed seasonal, 'Growers Choice' flowers are $85 per bucket. May & October, as well as specific colors orders are $100. Greenery buckets are $80 each. We can only guarantee flowers, with the placement of an order. We cut fresh flowers specifically for your order., so we need 48 hours in advance. If you'd like us to deliver a smaller wedding, some weekends, we can arrange delivery- pricing varies. Deposit: We require a 1/2 deposit on all orders. You are not on our calendar until we have a deposit. We like the initial deposits to be paid by check or cash. •For Design work payment is due 4 weeks prior to the event, check-in & finalization of details is 6 weeks prior to the wedding. •Bucket only orders- before or upon pickup- cash or credit card- no out of town checks. ​*You might also have a refundable bucket deposit that is cash only. *Hard goods used in wedding designs, are secured with a credit card number. By commissioning Shady Grove to design and create floral pieces for your event, we are entrusting the artists and representatives to utilize their design skills and capabilities shown during consultations and other events. We entrust Shady Grove Gardens to choose all floral varieties, color schemes and textures that will best showcase the ideas for the event. By signing this agreement, we allow Shady Grove Gardens full Artistic License to create distinctive and unique floral pieces and table-scapes. Feel free to send us your inspiration board, Pinterest, photos, or whatever you can. We will create an initial budgetary estimate, and send it back to you. If you would like to convey your “maximum” budget to us, it may save time during the process. Full service weddings include all floral designs plus setup and delivery. Delivery and return & clean-up is 10-20% of the design total. If you design total is under $2000 the delivery may be higher. If you would like to order individual items a la carte, the minimum is $250. These are picked up here in Zionville, NC. 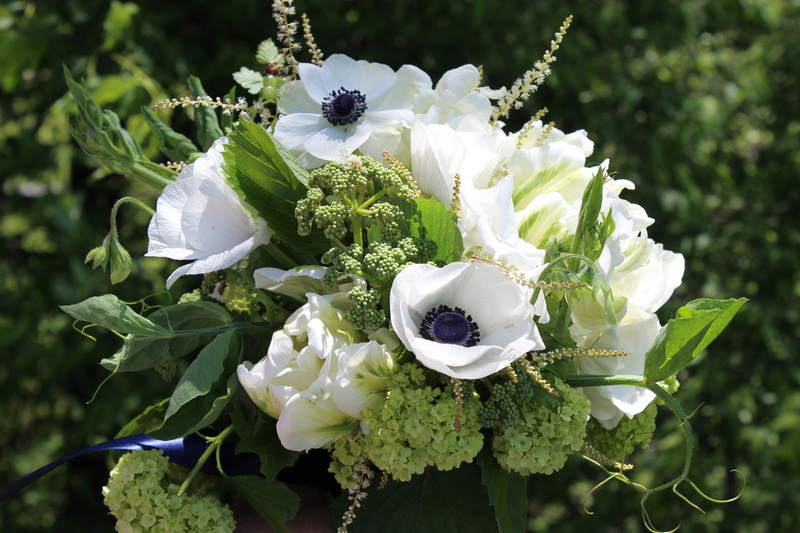 We welcome DIY brides and will be happy to sell you bucketfuls of flowers to work with. These are base prices using our locally grown farm flowers and custom created just for you. Your actual wedding prices will be determined after a consult, they may vary depending on size of the piece, the types of flowers used, container used. After completing the Wedding Inquiry form, Susan will usually schedule a consult. We meet with brides on Monday through Wednesday during the wedding season. We use your information as a start for the conversation. BRIDE’S BOUQUET: The bridal bouquet is typically $140-200. Cost increases if we use garden roses, or out of season blossoms. 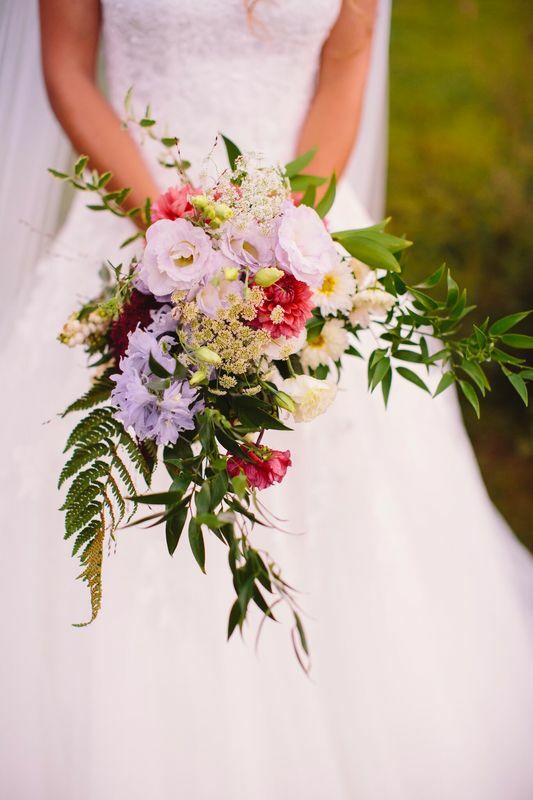 Cascading bouquets are more labor intensive and costly. The bridal bouquet is bound in the bride’s choice of ribbon and decorative pins. THROW BOUQUET: Throw bouquet is typically $50. At this price, the bouquet is created with a mix of flowers from the day. If you have a specific design you are wishing for please let us know, and we will adjust the price accordingly. BRIDESMAIDS’ BOUQUETS: Maids are usually $75 Cost increases if we use garden roses, or out of season blossoms. A helpful budget tip is to use your maid’s bouquets as centerpieces. If you choose this option, we suggest going for really full and lush bouquets.You may also order decorative vases for displaying them at the reception. 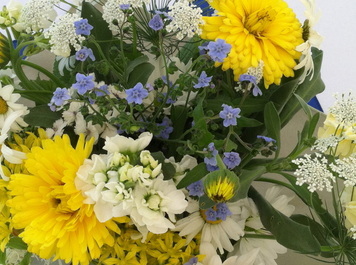 You may also choose a smaller simpler nosegay bouquet for the BMs $50-65. CORSAGES: Corsages come in several different styles. Woman Boutonniere size @$20-23, nosegay start @$25.00, wrist style corsages are $25.00, and pin-on style corsages are $30 . Corsages generally given to the mothers, grandmothers, female readers and other helpers of the day. We are very fond of the nose-gay bouquet and think this is a great way to set the moms apart. BOUTONNIERES: Bouts are $15. The groom’s bout is always made more special without an increase in price. Bouts are given to the groom, groomsmen, fathers, grandfathers, ring bearers, honored guests, and readers. We are known for our unique boutonnieres. Special wraps and ribbons as well as succulents will add to your cost. AISLE PETALS: Petals down the aisle begin at $160. Full beds of petals, designs or longer aisles will require an increase in price. CEREMONY PIECES: Urn/large arrangements are $150.00 and up. The appropriate size of the piece depends on the space. Smaller urns and containers $75-95 each. ALTAR ARCH/CHUPPAH/ ARBOR: We can decorate any structure, and the cost is based on the design and the size of the task. $300-500 is a common price range. Using an onsite or supplied arbor. Green or flowered garland may also be ordered. Foliage only garland for any arbor: priced by the foot depending on the foliage used. We rent our wrought iron arch arbor: we cover it with lush vines, willow and flowers ~$400 for most locations. Delivery and pickup are additional. GUESTBOOK TABLE: Our floral touch in this area ranges from @$25 and up. COCKTAIL TABLES: Simple and sweet designs can be created for $25-30. We also offer bud vases at $8-10 each with a 12 vase minimum. GUEST TABLES: Centerpieces can be created in many different price ranges but you should expect to pay at least $35.00 for a vase arrangement, most are $55. Small clusters of milk bottles are $20 with Elevated centerpieces starting at $150.00. The price of centerpieces increases with the use of expensive blossoms or if the pieces are exceptionally, rich, and full. You might consider the price per table option if we are adding other style options such as candles, votives, woodland decor. CAKE: Cake flowers start at $30.00 loose or a topper. CATERER: They usually want flowers and foliage to decorate with, so make sure they have some, and don't rob from the arrangements. Please plan on discussing all the details you need with Susan so she can get you and exact cost. Everything is a la carte.